The location of the resort has always been a plus point. The world-class luxury facilities in addition to the picturesque view of the Shivalik Hills, there is a lot more that this place has in store to offer to you. Being one of the best resorts in Chandigarh, the place has a lot to offer to you in terms of hospitality. Its location is one of the perks besides the quality of service that it offers. Taj is a benchmark in the hospitality industry when it comes to the luxury, the best service, and the world-class dining. No denying the fact that I can be a high-end price but the services are better than what you might expect. If you want to have a regal experience then you might go in for exploring this particular classy resort in Chandigarh. its ambience suits all the requisite, be it the business meeting ir a wedding, the ambience is just perfect. 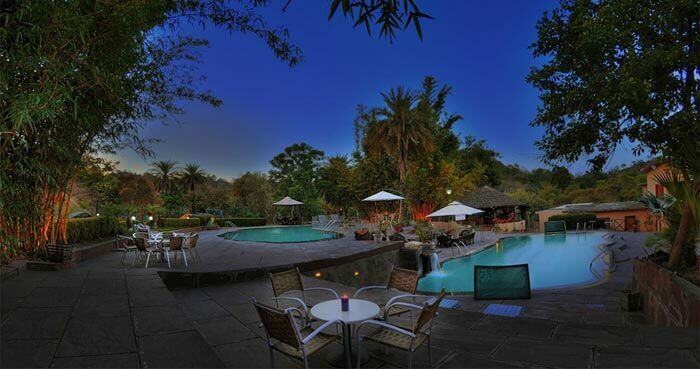 This is one of the best resorts in Chandigarh. This place offers you a mush required peaceful as well as a healing retreat. Not only is the staff courteous but here you get to experience neat and clean rooms and a peaceful stay. Being the Grand Old Hotel of Chandigarh, it knows well how to make the world-class hospitality available to the visitors. Apart from that the fine dining lures a lot of tourists d natives also to the place. This resorts tends to find a decent location near the most cherished Sukhna Lake. This golf course has won popularity for this resort in addition to the landscape that it is bestowed with. This is a perfect treat that you can have on your vacation or your stay. Aura Vaseela finds location in the suburbs of the city and is a village-themed resort. If you come here you get to experience as if you are enjoying living in a country side. The only difference is the superb amenities that you get here. This one is the newest establishment in this particular list. Within just a short span of time since it became operation in November 2017, the place has built a great reputation for itself in terms of ambience and the service quality. Golden Tulip offers you a very warm hospitality in addition to the delicious food. The plus point remains that it has a very good central location which attracts the people of all the spheres of the economy. All in all, these are the Top 10 Best Hotels And Resorts In Chandigarh that offer you the best experience.